Tribeca Luxe Hair Extensions have been developed by professional stylists to make sure the needs and desires of both the stylist and client were met. We created long lasting hair that is able to be colored, lightened and toned. The tones in our collection were specifically developed with the proper underlying pigments for a natural look that would allow for effortless toning to achieve an even and perfect match. All of our extensions begin with the highest quality hair, free from harsh chemicals and sealers. Every cuticle is aligned and sourced from a single donor with consistent density throughout. Our exclusive tape extension technology makes re-tapping easy, efficient and damage free. We designed our weft extensions to be flexible, soft and virtually shed free. Our extensions are produced using the highest grade technology available for micro sewn wefts. 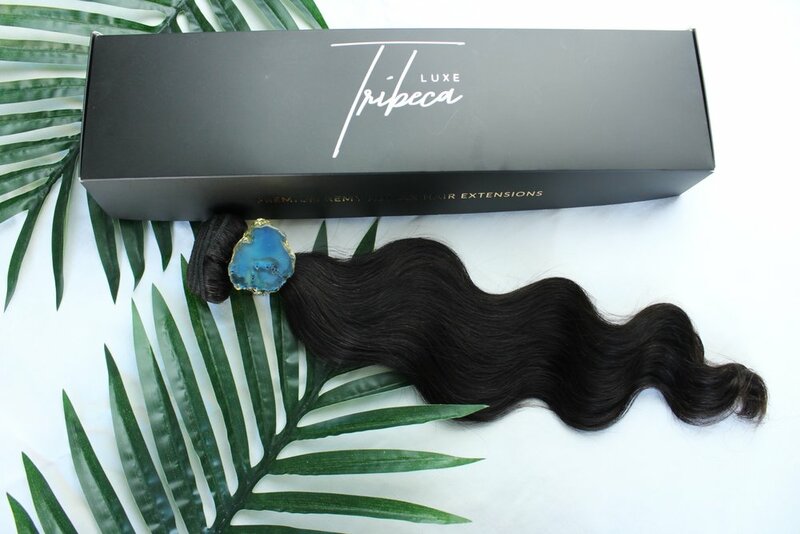 Tribeca Luxe Hair Extensions are the standard for pristine quality and longevity. Proper maintenance and care is always important with hair extensions. Always keep your hair hydrated and protected from heat styling. Consult with your hairstylist for more information. We are currently the only company to offer wavy tape extensions. Our natural body wave is extremely soft and just like our straight texture option, has no harsh sealers or chemicals. With virtually no taper at the ends, our hair looks just as full as it feels. The longer you wear your wavy tape extensions the more they mimic your natural wave. More than 60% of women have textured hair and now thanks to our exclusive technology there is a hair extension option for everyone. We will also soon be launching curly texture tape extensions. You will learn the quickest most effective ways to apply, adjust and color hair extensions. Our classes are instructed by some of our lead stylists. We want to ensure all Tribeca Luxe ambassador stylists have the latest in hair extension education. You can currently register for tape or micro bead weft extension methods. Free education is available for Tribeca Luxe stylists. For more information contact us via email. For more information submit social media handle and valid cosmetology license. All professional stylists receive an industry discount and free shipping* on qualified orders. To enroll in our stylist program please submit a valid cosmetology license.